Recently, a media group making up by numbers of Philippines press corps was visiting Modern Cancer Hospital Guangzhou, Boai Medical Group, China. The visiting media includes the World Journal, the Philippines Star and other major authority media. For the past 7 years, Modern Cancer Hospital Guangzhou has been adhering to the Boai spirit which is "patient-oriented, individual treatment and health care without borders" and helping people overseas to conquer cancer despite the risks. 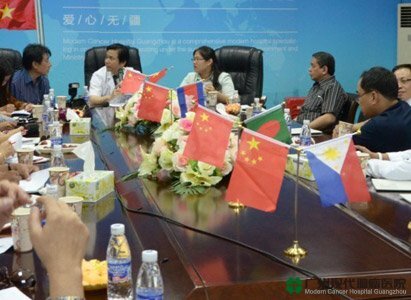 For receiving those patients who were given up treatment or declared ineffective to treatments by the local hospitals and giving them higher quality medical services, Modern Cancer Hospital Guangzhou has established a medical consultative branch office in Manila, Philippines. Minimally invasive targeted treatment and combination of TCM and western medicine is an anti-cancer treatment originated by Modern Cancer Hospital Guangzhou, the advantage of which is it can perfectly combine traditional Chinese medicine and Western medicine, identify the basic reason of cancer and make targeted treatment with a bran-new treating system. Due to its small side effects, minimally invasive targeted treatment and combination of TCM and western medicine can reduce the patient's pain to a large extent. On the other hand, it can achieve the biggest treatment effect with a minimal trauma, which is also the most important aim of minimally invasive. This treatment has achieved very good treatment effects clinically. In the Philippines, many patients have achieved very good treatment effects after taking timely treatment in Modern Cancer Hospital Guangzhou. Modern Cancer Hospital Guangzhou is well-known overseas because of its creative anti-cancer technologies. Also, the hospital has received reputation from numerous patients and media of the Philippines, Indonesia, Vietnam and Bengal. To witness the procedure of minimally invasive targeted treatment and combination of TCM and western medicine is one of the main purposes of the media group's visit to Guangzhou, China. The visiting 18 Philippines senior media professionals are very interested in Modern Cancer Hospital Guangzhou, China, which is an international modern cancer treating institution, since news reports about the hospital’s advanced technologies and successful treated cases are frequently seen in recent years. Particularly, its originated unique anti-cancer technology, minimally invasive targeted treatment and combination of TCM and western medicine has become a leading banner in the field of cancer treatment. Chief physician, Director Peng Xiaochi who is a cancer authoritative expert in the field of minimally invasive targeted treatment accepted an interview by the media group. Peng was graduated from Zhongshan Medical University and studied abroad in Canada. After returning back to China, he has been long time engaged in cancer research and clinical treating work. Director Peng has very rich experience in high-tech minimally invasive targeted treatment. For the past years, Director Peng have actively participating in domestic and international cancer academic meetings, sharing experiences with other professors in the same occupation, continuing dedicating medical theory and advanced technology to people all over the world. Modern Cancer Hospital Guangzhou, China, has been inheriting the marrow of traditional Chinese medicine culture which has a history of thousands of years, making all efforts to break through difficulties to establish a traditional Chinese medicine treatment system. This system embodies the research and produce of anti-cancer drugs, clinical cancer treatment and rehabilitation. In connections with lesions in different locations and different complications, Modern Cancer Hospital Guangzhou has made up a team on conquering cancer treating problems. After many years of hard studying and researching, authoritative clinical medicine experts together with pharmacy experts have developed dozens of medicine for treating cancer. Inputting liquid traditional Chinese medicine to patients in the form of oral administration or infusion can not only effectively inhibit the growth of cancer, but also increase the body immunity to a large extent. Combined with traditional Chinese diet therapy, it can achieve the purpose of strengthening physical fitness and treating cancer. Diet therapy is a treatment combined food and drugs reasonably utilizing traditional Chinese cooking techniques. Modern Cancer Hospital Guangzhou developing the advantages of this therapy and providing patients with a professional nutritional counseling and guidance during ward visits. Innovation: “minimally invasive targeted treatment and combination of TCM and western medicine” has become a pioneering work in the field of cancer treatment. Modern Cancer Hospital Guangzhou not only inheriting and carrying forward traditional national medicine, but also ingeniously merging western medicine together. This originated diagnosis and treatment technology continuously benefits cancer patients. Minimally invasive targeted treatment and combination of traditional Chinese medicine has become a world leading cancer therapy in the 21st century. Modern Cancer Hospital Guangzhou has gathered a large number of Asian top cancer imaging interventional specialists, forming a cancer treatment team which is well-known for their advanced treatment techniques such as interventional embolization, radioactive particles implantation, biological immune therapy, argon helium cryotherapy, and other minimally invasive treatments in Southeast Asian countries. Experts’ complement in technologies has made full use of the advantages of the team and made the hospital’s cancer treatment to a world leader level. In the same, another powerful advantage of Modern Cancer Hospital Guangzhou is its integrated use of international advanced medical equipments. It is equipped with imported European PET-CT, Israeli Ar-He cryo-knife, American DSA machine and other large equipments. Thus, minimally invasive targeted treatment system and the combination of TCM and western medicine have created a unique and new cancer treating mode. The biggest feature of this treatment is less trauma, fast effect, quick recovery and local targeted cancer destruction. It roots out excessive treatment and alleviates the suffering of patients, greatly extends their survival time and improves their quality of life. After the introduction by Director Peng, the hospital arranged the press corps to watch the procedure of particle implantation and argon helium cryotherapy on-site. The Philippine press corps has witnessed the superior technology and excellent teamwork of Modern Cancer Hospital Guangzhou personally. During the operation, all the experts organized the whole procedure in an orderly manner, they act in harmony and promptness, busy but not chaotic. 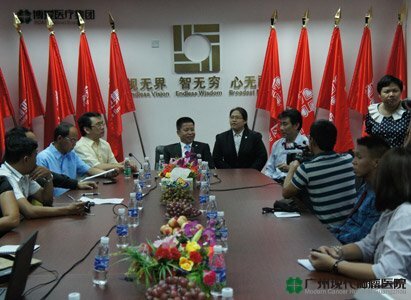 Prof Peng, director of the cancer expert team, indicated that Modern Cancer Hospital Guangzhou will be constantly pay close attention to the researches and development of cancer of all medical academic institutes, will always dedicate to provide each patient world advanced treatment technology, relieve their pain and bring hope to them. Modern Cancer Hospital Guangzhou will continue to research and work as in the past, making greater contributions for mankind to conquer cancers!